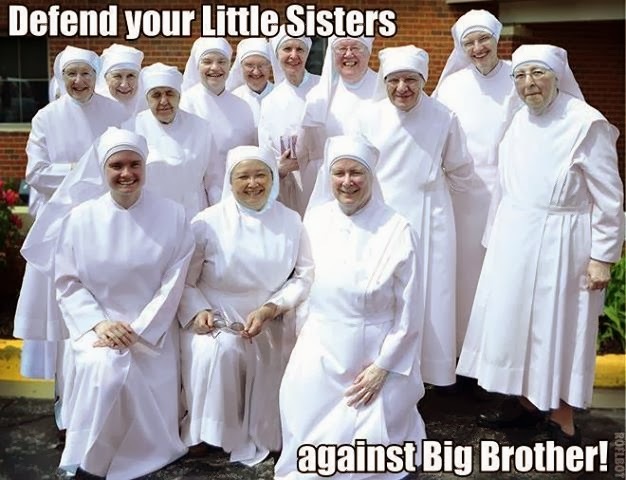 When you refer to these gals, the Little Sisters of the Poor, whose mission is to serve the elderly poor in impoverished neighborhoods, as "threatening." Joanne McPortland, (a sensible Liberal & recently-returned-Catholic) rightly calls this kind of thing the "noveau Know-Nothingism." Here (as noted yesterday in my Twitter feed), she smacks down a frankly bigoted piece from US News denouncing Sonia Sotomayor, who is turning out not to be such a wise Latina in the Left's mind after all. And that because she simply wanted to give a fair hearing to the Ladies in the picture before forcing them to pay for abortions and sterilizations. And that, my friends, is how a genuinely liberal Democrat -- as opposed to a Progressive tyrant-- treats a nun. please don’t dismiss this as Catholics crying persecution. We’re not stupid. We know the difference between persecution and ignorant, rabble-rousing bigotry. We will pray for those around the world experiencing the former, but by damn we will not stand for the latter.